• Where to find free online courses; NEW! • Ways to partner with public schools; NEW! • Keys to graduating a homeschooler; NEW! • Developing personal finance management and life skills; NEW! • Career and vocational guidance; NEW! Introduced in 2000, Homeschool Your Child for Free gave countless parents the plan and peace of mind to get their kids’ education on the right track. 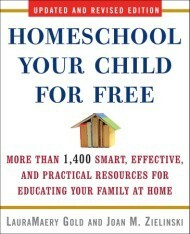 Now, authors Laura Maery Gold and Joan M. Zielinski have revised and updated their popular guide, offering their expert homeschooling advice and information, plus new tools and resources to help you and your child succeed: • Complete curriculum plans for a comprehensive education, from preschool through high school • Where to find free online courses; NEW! • Ways to partner with public schools; NEW! • Legal guidelines and compliance requirements for home educators • Keys to graduating a homeschooler; NEW! • Developing personal finance management and life skills; NEW! • Teaching tips and motivators from successful homeschoolers • Career and vocational guidance; NEW!